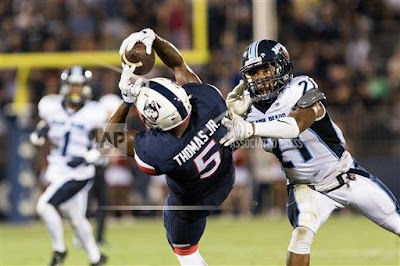 Noel Thomas was targeted 14 times in UConn's season-opening win. It's taken me a little longer than originally anticipated to get around to going this but I wanted to watch a replay of the game before giving my thoughts on the 24-21 win over Maine. My first thought was that I was disappointed from what I saw up front on both sides of ball especially in the first half. It started early as UConn's first offensive possession ended on a sack when three linemen went to block one player allowing linebacker Sterling Sheffield to come up the middle untouched for an easy sack. That type of miscommunication short circuited so many drives a season ago and seeing it happen on the fifth play of the season was concerning. For all the talk of being bigger, stronger and faster, I was expecting a more dominating showing from the opening snap. Maine had 10 tackles for loss in the game and five other times, quarterback Bryant Shirreffs made positive yardage after being hit in the backfield. UConn coach Bob Diaco said it was a case of Maine "storming the castle." He is correct, Maine blitzed early and often but with UConn rarely throwing the ball down the field, there is little risk in a team bringing linebackers and defensive backs to either disrupt the running game or get to Shirreffs. I would compare it to giving an intention walk in baseball and seeing the batter hit a weak ground ball to second base. If the player who comes up after the intentional walk crushes the ball into the gap, teams will think twice before revisiting that strategy. It's the same thing in football. If there's little risk of having a ball thrown over your head, why not send guys into the backfield? Something tells me we will be seeing more of that by UConn opponents this season. Another issue from a season ago also returned as other than Noel Thomas, no other wide receiver was targeted in the passing game until Brian Lemelle's huge catch with 21 seconds left to play to set up the winning field goal by Bobby Puyol. Counting the pass interference call drawn by Thomas, UConn threw the ball 24 times and 14 of those throws headed in Thomas' direction. Tyler Davis, who only recently moved to tight end, and Arkeel Newsome ranked second on the team with three targets each. Tight ends Tommy Myers and Alec Bloom as well as receivers Tyraiq Beals and Hergy Mayala combined to be targeted ONCE and that resulted in Myers' 15-yard reception. That simply can't happen. There are playmakers on this team and falling into a pattern of forcing the ball to Thomas is a recipe for disaster. Mayala in particular impressed me during the preseason practices I went to and he needs to be involved in the passing game more than just being a downfield blocker. Some of the blame could fall onto Shirreffs' shoulders since I don't know who the intended target would have been on designed pass plays that turned into scrambles by Shirreffs. There are times when Shirreffs needed to take off and he saved a bunch of plays with his ability to escape the pass rush but there were other times when he gave up on the play way too early. I've said it before but Shirreffs' running ability can be one of his greatest attributes but also one of his greatest weaknesses. There's no questioning his toughness but taking some of the hits that he did on Thursday will take its toll moving forward. That balance of when the take off and make the most out of a broken play and when to extending plays so he can make throws down the field is something he will continue to work on. There were also some costly blown coverages resulting in Josh Mack's 20-yard touchdown catch and Reed's 48-yard reception. Game management issues were there as well for Diaco. He has a conservative approach to football (see lack of punt returns) but still I thought giving Puyol a shot at a 52/53 yard field rather than take an intentional delay of game penalty so the clock would run out was a questionable decision as was the quick timeout after Shirreffs was instructed to get the best ball placement for Puyol's field goal was a head scratcher. Nothing came out of it on the final play but why not make Puyol's kick the final play of the game? Diaco said he called the timeout because the play clock was running down but watching the replay, that was not the case. Heralded redshirt freshman Matthew Peart had moments when his inexperience showed but he also had his impactful moments as well. He had a key block (along with Myers and Bloom) on Johnson's 21-yard TD run and did well on Arkeel Newsome's scoring run as well. With all the negatives I just mentioned, UConn did win the game so learning after a victory is so much better than having to make corrections after a loss. I liked what I saw from the offensive line in the latter stages of the game even having some success with an unbalanced line in the second half which at least give the Navy coaches something extra to prepare for in practice in the coming days. Brendan Vechery, who came in at left guard for an injured Tommy Hopkins, deserves plenty of credit which he received when I asked Diaco about his performance after the game. "Kudos to him," Diaco said. "He could have very easily pouted when Croz (starting center Ryan Crozier) came back and he started for 13 games as a starting center. He just went to work, he can work, he learned three positions, he can play guard, he can play tackle as the next man in at a lot of different spots. He went in on the PATs and field goals, kudos to him, his mindset and his preparation leading up to this point." Diaco said that both Anthony Watkins and Brice McAllister would play at strong safety and he wasn't kidding. I attempted to break down the snap count for the two of them but with safeties not always visible in the TV broadcast, I was unable to do that. However, McAllister seemed to be out there more than Watkins as the game wore on. Watkins had a tough opener, he missed a couple of tackles including one that Jaleel Reed turned into a 48-yard catch and run. Reed also beat Watkins (with Obi Melifonwu arriving late) on a 40-yard touchdown catch. With McAllister looking like the more physical of the two and the Huskies facing Navy's run-dominated triple-option offense a week from today, I wouldn't be surprised to see McAllister in there early and often in the next game. Justin Wain, with three of his five punts inside the 20, had a net average of 42.6 yards the best for a UConn punter since the 2013 game against South Florida. Bobby Puyol, in addition to his winning FG, had three touchbacks on five kickoffs as Maine's average starting position was its own 19 with the best starting position being the 27. That is a centerpiece of how Diaco wants things to go. Davis looks like he could play a key role in the passing game (one that likely would have been filled by Billy Williams had he remained) and Vontae Diggs looked like a playmaker in his first career start. Also, while UConn didn't have a sack, I thought one of the key plays in the game was Luke Carrezola's pressure off the edge forcing an inaccurate throw on the drive when Maine had its potential go-ahead field goal blocked. Reed was clearly open on the play and if Maine quarterback Dan Collins had time to throw the ball, the Black Bears likely would have had a seven-point lead late in the game. UConn only had three penalties in the game. One was the intentional delay of game referenced above, another was a rather questionable pass interference call on John Green and then Carrezola was whistled for a roughing the passer penalty. In the second half there were none of the "let's call a timeout before the play clock runs out" issues that hurt the Huskies last season. With Navy coming up, any issues in the pass coverage probably won't be addressed until the preparation leading into the Virginia game since the focus will be on the discipline needed to deal with a triple-option offense. While I am sure plenty of fans were upset with the opening game showing, it can be dangerous to place too much emphasis on the opening game. In 2011 and 2012, the Huskies won their opening games by a combined score of 72-3 only to limp to 5-7 seasons each time. Having seen a lot of different looks offensively in practices, I would say that the UConn staff wasn't rolling everything out there and there is hope that things will look better moving forward.